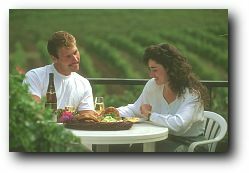 VQA wines, with crisp, clean flavours, are the ideal accompaniment to a wide variety of foods. Choosing wines that best suit your meal can be intimidating with the endless list of food and wine pairing rules to remember. Really, there is only one rule that deserves to be carved in stone. THERE ARE NO RULES! So relax, experiment and enjoy yourself. 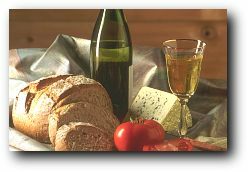 Of Course a little knowledge might help you learn which VQA wines you prefer with your favourite foods. These are the three key elements which combine to create the character of every wine you buy; consider them equally when creating your own inspired food and wine pairings. Flavour: the taste of the wine. 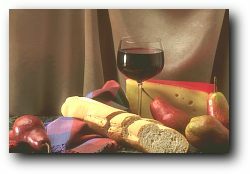 Successful food and wine pairings rely on either a similarity or, less commonly, a contrast of flavours. Intensity: how concentrated in flavour the wine is. 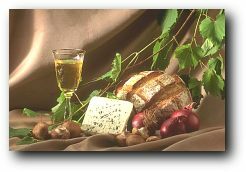 The stronger the flavour of the wine, the stronger the flavour of the food; in this case, the ideal match is always one of similarity, never contrast, so that neither food nor wine is over-whelmed. Texture: the feel of the wine in your mouth, resulting from the influence of all the components of the wine - fruit, alcohol, acid and tannin. As with flavours, the match may be one of either similarity or contrast. Chardonnay's rich elegance finds its match in foods that are equally stylish. Bolder examples show especially well with strongly herbed dishes, while more restrained versions shine in the company of luxurious cream and butter sauces and mellow, earthy flavours such as mustard and mushrooms. Flavour: Apple, lemon, pear, banana, fig, straw, sometimes slightly earthy or herbaceous; if barrel-fermented and / or oak-aged, butter, butterscotch, toast, vanilla, nutmeg. Texture: Firm and crisp if stainless-steel fermented; if oak treated round and medium-to-full-bodied. Pinot Blanc - sometimes called the poor man's (or women's) Chardonnay, well-made Pinot Blanc can show remarkable strength of character. 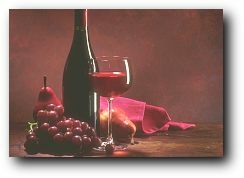 It is a chameleon of wine, providing a rich, subtle back-ground for whatever dish it accompanies. Flavour: Ranges from mineral, citrus and petrol to ripe peach, apple, herb and floral. No matter what the style, Riesling maintains an attractive balance of fruit and acidity, making it an exciting match with dishes incorporating their own sweet and tart elements. The most fruit-driven examples take well to barbecued or smoked foods and a wide variety of fruity and subtle spicy flavours. Flavour: Clove, rose, lychee, grapefruit, fruit salad; drier styles also mineral, earth, pepper, citrus. Texture: Medium-light to full-bodied, lively. Gewurztraminer is one of the most popular varieties, and for good reason; its intense, exotic aromas and flavours seem ideally suited to spicy cuisines from China to Thailand to India, and it stands up equally well to the fruitiest salsas and smokiest grilled and barbecued flavours of contemporary North American cuisine. Flavour: Raspberry, plum, black cherry, licorice, orange, coffee, toffee, chocolate. Texture: Medium-to-full-bodied, can be tannic. Merlot is THE red wine for red meats. It has the weight and fruit to match wine-braised stews and roasts and the structure and polish to pair with rare-grilled prime cuts. Flavour: Blackcurrant, cedarwood, blackberry, sometimes eucalyptus, bell pepper, green olive. While the classic accompaniment is rack (or leg) of lamb, Cabernet Sauvignon stands up beautifully to virtually all red meats, whether served simply with 'jus' or rich, reduced sauces. Fine, older Cabernets are excellent accompaniments to special occasion meals, while younger ones match simpler fare. Flavour: Cherry, strawberry, plum, violet, beetroot, mint, smoke, cinnamon; mature examples also tea, leather, brown sugar, mushroom, even barnyard. Pinot Noir's greatest strength is its suppleness. Without the hard tannic structure found in many red wines, it pairs effortlessly with a wide range of foods - from fish through game birds to grilled beef and lamb. Don't overwhelm its gentle fruit and refined complexity with strong or spicy flavours; simply-prepared dishes are best.